A recent nationwide survey from East Carolina University’s Center for Survey Research measures American attitudes on life, liberty and happiness 242 years after Thomas Jefferson first penned those words in the Declaration of Independence. Not surprisingly, the survey’s results show strong partisan division on questions about gun control and restrictions on speech. The research center’s director Peter Francia says what is noteworthy is that despite political differences like these, almost two-thirds of Americans say they’re satisfied with their lives. 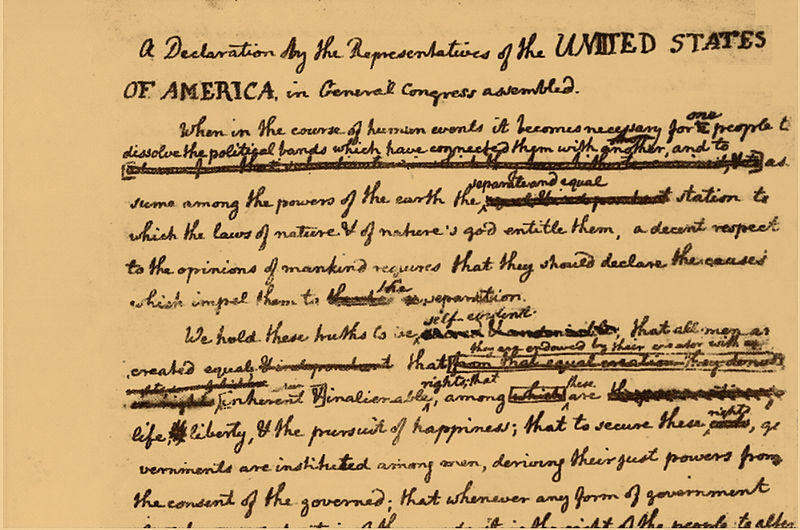 Draft of the Declaration of Independence. “In an era of political divisiveness, I think it’s important to remember that there are some things that indicate some good news. And that was encouraging to see such a high percentage of Americans answer that way,” Francia said. Francia says while Americans who support President Trump are slightly more likely to report satisfaction with their lives, income is an even greater predictor of overall happiness.